This paper presents a model approach to examine the relationships among e-learning systems, self-efficacy, and students' apparent learning results for university online courses. Independent variables included in this study are e-learning system quality, information quality, computer self-efficacy, system-use, self-regulated learning behavior and user satisfaction as prospective determinants of online learning results. An aggregate of 674 responses of students completing at least one online course from Wawasan Open University (WOU) Malaysia were used to fit the path analysis model. The results indicated that system quality, information quality, and computer self-efficacy all affected system use, user satisfaction, and self-managed learning behavior of students. An important goal of e-learning systems is to deliver instructions that can produce equal or better outcomes than face-to-face learning systems. To achieve the goal, an increasing number of empirical studies have been conducted over the past decades to address the issue of what antecedent variables affect students' satisfaction and learning outcomes and to examine potential predictors of e-learning outcomes [1, 2]. A primary theme of e-learning systems research has been empirical studies of the effects of information technology, instructional strategies, and psychological processes of students and instructors on the student satisfaction and e-learning outcomes in university online education. The research model we developed is a blend of a management information systems (MIS) success model , a conceptual model of Piccoli et al., , and an e-learning success model of Holsapple and Lee-Post . Based on the review of 180 empirical studies, DeLone and McLean presented a more integrated view of the concept of information systems (IS) success and formulated a more comprehensive model of IS success. Their IS success model identified six constructs that are interrelated and interdependent: system quality, information quality, use, user satisfaction, individual impact, and organizational impact. DeLone and McLean's  model is further extended and adapted to e-learning settings by many e-learning systems research. Holsapple and Lee-Post  adapted the DeLone and McLean model to propose e-learning success model (Figure 1). The proposed e-learning success model consists of three antecedents constructs (system quality, information quality, service quality) and two intervening constructs (system use and user satisfaction) and system outcome measuring academic success and systems efficiency and effectiveness (Figure 2). The primary objective of this study is to investigate the determinants of students' perceived learning outcomes and satisfaction in university online education using e-learning systems. Using the extant literature, we begin by introducing and discussing a research model illustrating variables affecting e-learning systems outcomes and user satisfaction. We follow this with a description of the cross-sectional survey that was used to collect data and the results from a path analysis model. In the final section, we outline the implications of the results for higher educational institutions. E-learning success model and sample matrix. Source: . The e-learning systems literature has accumulated a considerable body of literature over the past decade [1, 7, 8]. Nevertheless, little empirical research exists to understand the relationships among e-learning systems quality, the quality of information produced by e-learning systems and e-learning systems outcomes. E-learning systems comprised of a myriad of subsystems that interacts each other. They include human factors and design factors. Human factors include personality Characteristics [9, 10], learning styles [11–14], and instructor's attributes ). Design factors include a wide range of constructs that affect effectiveness of e-learning systems such as technology [5, 16–18], learner control, learning model [19, 20], course contents and structure [21–23], and interaction [23–26]. In a study of Eom et al. , structural equation modeling is applied to examine the determinants of students' satisfaction and their perceived learning outcomes in the context of university online courses. Independent variables included in the study are course structure, instructor feedback, self-motivation, learning style, interaction, and instructor facilitation as potential determinants of online learning. A total of 397 valid unduplicated responses from students who have completed at least one online course at a university in the Midwest were used to examine the structural model. The results indicated that all of the antecedent variables significantly affect students' satisfaction. Of the six antecedent variables hypothesized to affect the perceived learning outcomes, only instructor feedback and learning style are significant. The structural model results also reveal that user satisfaction is a significant predictor of learning outcomes. The findings suggest online education can be a superior mode of instruction if it is targeted to learners with specific learning styles (visual and read/write learning styles), and with timely, meaningful instructor feedback of various types. Eom et al. found that all six factors: course structure, self-motivation, learning styles, instructor knowledge and facilitation, interaction, and instructor feedback, significantly influenced students' satisfaction. This is in accordance with the findings and conclusions discussed in the literature on student satisfaction. Of the six factors hypothesized to affect perceived learning outcomes, only two (learning styles and instructor feedback) were supported. Contrary to previous research , Eom et al., [13, 28] found no support for a positive relationship between interaction and perceived learning outcomes. One possible explanation for this finding is that the study did not account for the quality or purpose of the interactions. Although a student's perception of interaction with instructors and other students is important in his/her level of satisfaction with the overall online learning experience, when the purpose of online interaction is to create a sense of personalization and customization of learning and help students overcome feelings of remoteness, it may have little effect on perceived learning outcomes. Furthermore, a well-designed online course delivery system is likely to reduce the need of interactions between instructors and students. The university under study has a very friendly online e-learning system and strong technical support system. Every class Web site follows the similar design structure which reduces the learning curve. Contrary to other research findings, no significant relationships were found between students' self-motivation and perceived learning outcomes. Theoretically, self-motivation can lead students to go beyond the scope and requirements of an educational course because they are seeking to learn about the subject, not just fulfill a limited set of requirements. Self-motivation should also encourage learning even when there is little or no external reinforcement to learn and even in the face of obstacles and setbacks to learning. This research further extends the study of Eom et al. which did not include several constructs on which this study focuses. This research addresses the effects of system quality, information quality, self-regulated learning, and self-efficacy on the e-learning system use, user satisfaction, and e-learning outcomes. An e-learning system typically consists of learning management systems (LMS) and authoring systems. The LMS is a system for storing and delivering the course content, and tracks student access and progress. The authoring systems allow the instructors to develop the contents for e-learners. H1a: e-learning system quality will lead to a higher level of system use. H1b: e-learning system quality will lead to a higher level of user satisfaction. H2a: Information quality will lead to a higher level of system use. H2b: Information quality will lead to a higher level of user satisfaction. A goal of e-learning empirical research includes the identification and effective management of factors that influence e-learning outcomes . One of such factors is computer self-efficacy of e-learners. Numerous e-learning empirical studies have been conducted to examine the relationships between e-learners' computer self-efficacy and other construct such as student satisfaction and e-learning outcomes. Significant positive relationships were found between self-efficacy and e-learning system use intention. Computer self-efficacy, attainment value, utility value, and intrinsic value were significant predictors of individuals' intentions to continue using Web-based learning . Therefore, I hypothesize the following. H3a: Computer self-efficacy will lead to a higher level of system use. Johnson et al.,  found that student self-efficacy and perceived usefulness of the system predicted perceived content value, satisfaction, and learning performance. Other system-related studies have examined attitudes and behaviors influencing course management system usage. Significant positive correlations were found among the three e-learning variables (Self-efficacy, e-learner satisfaction and perceived usefulness . H4a: Computer self-efficacy will be positively related to e-learner satisfaction. Computer self-efficacy was positively linked to learning outcomes measured by the average test scores in e-learning  and in the training literature . H5a: Computer self-efficacy will be positively related to online learning outcomes. A study of Eom et al. examined the determinants of students' satisfaction and their perceived learning outcomes in the context of university online courses. Their study found that all of the antecedent variables (course structure, instructor feedback, self-motivation, learning style, interaction, and instructor facilitation) significantly affect students' satisfaction. Their structural model results also reveal that user satisfaction is a significant predictor of learning outcomes. H6a: User satisfaction will lead to higher levels of student agreement that the learning outcomes of online course are equal to or better than in face-to-face courses. H6b: Self-regulated learning behavior of e-learners will be positively related to online learning outcomes, which is equal to the quality of traditional classroom learning. The survey instrument consisted of 35 questions addressed using a seven point Likert scale ranging from "strongly disagree" to "strongly agree." In addition, students were asked six demographic-type questions. The survey was administered online in the fall semester of 2009 at a Wawasan Open University (WOU) Malaysia. A total of 2,156 online students were invited to reply to the survey. Of those students invited, 809 students responded with 674 surveys being complete and usable for a response rate of 31.3%. Appendix A summarizes the characteristics of the student sample. To conduct a path analysis, we only used the following 7 questions to represent our variables. ◦ System Quality: The system is user-friendly. ◦ Information Quality: The system provides information that is exactly what you need. ◦ System Use: Items I frequently use the system. ◦ User Satisfaction: Overall, I am satisfied with the system. ◦ Learning Outcome: I feel that online learning is equal to the quality of traditional classroom learning. ◦ Self-managed learning Behavior: In my studies, I am self-disciplined and find it easy to set aside reading and homework time. ◦ E-learning System Self-efficacy: I feel confident using a web browser. The research model (Figure 2) was tested using path analysis. LISREL 8.70 was used to do path analysis. It is a technique to assess the causal contribution of directly an observable variable to other directly observable variables. The model consists of three independent variables (system quality, information quality, and self-efficacy) and 4 dependent variables (system use, user satisfaction, self-regulated learning behavior and e-learning Outcomes). A total of 674 valid unduplicated responses from students who have completed at least one online course at a university in the Wawasan Open University Malaysia were used to fit the path analysis model. Model testing is to test the fit of the correlation matrix of sample data against the theoretical causal model built by researchers based on the extant literature . Goodness of fit statistics includes an extensive array of fit indices that can be categorized into six different subgroups of statistics that may be used to determine model fit. For a very good overview of LISREL goodness- of-fit statistics, readers are referred to . There seems to be an agreement among SEM researchers that it is not necessary to report every goodness of fit statistics from path analysis output. Although there are no golden rules that can be agreed upon, Table 1 includes a set of indices that have been frequently reported and suggested to be reported in the literature [39, 40]. Table 1 includes our model fit statistics of various fit indices and corresponding acceptable threshold levels of each corresponding fit index. Considering all indices together, the specified model (Figure 2) seems to be supported by the sample data. Since our model is tested bas on sample size of 674, Chi-Square statistic is not a good measure of goodness of fit, since Chi-Square statistic nearly always rejects the model when large samples are used . The RMSEA is the second fit statistic reported in the LISREL program. A cut-off value close to .069 indicates a close fit and the values up to 0.08 are considered to represent reasonable error of approximation. Figure 3 shows the summary of path analysis. The bold lines indicate 10 supported hypotheses and the other lines indicated 5 hypotheses that were not supported. Summary of the path analysis. According to the latest industry statistics, "the e-learning market in the Malaysia is growing approximately 43 percent a year and is expected to reach well beyond $27 billion within the next several years" . Higher educational institutions have invested heavily to constantly update their e-learning management systems. The findings from the current study have significant implications for the distance educators, students, and administrators. We have focused on the effect of e-learning management systems on user satisfaction, and the relationship between user satisfaction and e-learning outcome. E-learner satisfaction is an important predictor of e-learning outcome. On the other hand, system quality, information quality, and self-regulated learning behavior have significant direct impacts on the perceived satisfaction of e-learners. Self-efficacy does not show a direct effect on user satisfaction, but it shows indirect effect on user-satisfaction via self-regulated learning behavior. It is conceivable that, through this type of research, online learning will be enhanced when there is a better understanding of critical success factors for e-learning management systems. Learning is a complex process of acquiring knowledge or skills involving a learner's biological characteristics/senses (physiological dimension); personality characteristics such as attention, emotion, motivation, and curiosity (affective dimension); information processing styles such as logical analysis or gut feelings (cognitive dimension); and psychological/individual differences (psychological dimension) . Moreover, e-learning outcomes are the results of dynamic interactions among e-learners, instructors, and e-learning systems. This study may be useful as a pedagogical tool for all entities involved in the dynamic learning process. First, university administrators must continuously invest to upgrade the systems so that e-learning systems exhibit faster response time, better systems accessibility, higher system reliability and flexibility, and ease of learning. By doing so, e-learning systems can provide e-learners with the information that are accurate, precise, current, reliable, dependable, and useful. This study provided a basis for justifying technological expenditures at the administrative level. Second, e-learners must be able to self-manage the entire learning process including self-regulation of behavior, motivation, and cognition, proactively and deliberately. The core of self-regulated learning is self-motivation. Students' motivation is a major factor that affects the completion rates in the Web-based course and a lack of motivation is also linked to high dropout rates . The instructor in e-learning courses should facilitate, stimulate, guide, and challenge his/her students via empowering them with freedom and responsibility. Instructor feedback to students can improve learner affective responses, increase cognitive skills and knowledge, and activate meta-cognition, which refers to the awareness and control of cognition through planning, monitoring, and regulating cognitive activities . Information quality has positive effects on user satisfaction. Information quality has also positive effects on system use, which in turn positively contributes user satisfaction. However, the information quality in e-learning is not dependent on only e-learning management systems' software and hardware. It is the instructor who creates the contents of e-learning material that are useful and essential for gaining necessary knowledge for the future success of students. In information systems, the roles of instructors as a contents creator are even more critical when assembling daily/weekly reading assignments for each semester by selecting chapters, topics within a chapter, project assignments, and creating power point files and supplementary files, due to the fact that the nature of information systems are constantly changing with a fast speed. Information systems educators are continuously witnessing the emergence of a host of disruptive technologies such as virtualization and cloud computing. According to the ranking of technologies Chief Information Officers (CIOs) selected as their top priories in 2010, virtualization and cloud computing were the number one and number two priorities. Cloud computing was not on the radar in 2007 and 2008. It was a distant 14 in 2009. Cloud can help firms do more with less. Moreover, the technologies that CIOs are prioritizing in 2010 are technologies that could be implemented quickly and without significant upfront expense . However, some introductory information systems textbooks even did not mention these topics at all. For this reason, the instructor must play a pivotal role to create and enhance the quality of information for e-learners. Abundant e-learning empirical research points out those superior e-learning outcomes are one of the critical objectives of e-learning research. Our path analytical model suggests that of these six variables I hypothesized, all of them are useful predictor of e-learning outcomes, except the following three unsupported hypotheses. 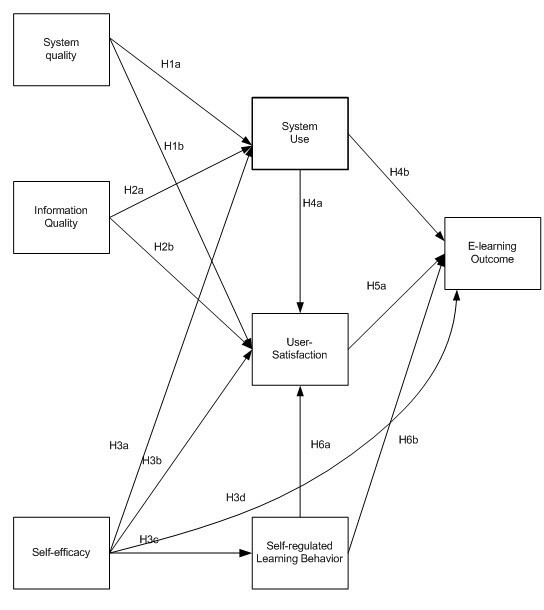 The paths from system quality and information quality to user satisfaction, system use to user satisfaction, and user satisfaction to e-learning outcomes were significant as hypothesized by the DeLone-McLean model. On the other hand, the paths from system quality to system use, system use to e-learning outcome, and self-efficacy to user satisfaction were not significant. This negative finding may be explained by the mandatory nature of the e-learning system. This is in accordance with the findings of the study of Livari , which tested the DM model in a mandatory city government information system context. System use is the pivot of the DM model. System use, either actual or perceived, is one of the most frequently reported and the most objective measure of MIS success or the MIS success measure of choice in MIS empirical research  in a voluntary IS use context. The DM model has been empirically tested using structural equation modeling in a quasi-voluntary IS use context  and in a mandatory information system context . Nevertheless, the usage of information and systems, as repeatedly pointed out by DeLone and McLean , is only relevant when such use is voluntary. Needless to say, e-learning systems are mandatory systems. Regardless of the quality of the e-learning management system, e-learners must use the system. We suggest that future e-learning empirical studies exclude "system use" construct in the model. A retraction note to this article can be found online at http://dx.doi.org/10.1186/2192-1962-3-11. An erratum to this article is available at http://dx.doi.org/10.1186/2192-1962-3-11. This research is supported by TWAS Research and Advanced Training fellowship (2010) cycle conducted in UTM Malaysia. Special thanks to Faculty of Computer Science and Information Systems Universiti Teknologi Malaysia (UTM) for facilities, research guidance and comments about the material and structure of this research. Dr. Tanzila Saba has obtained PhD degree from Faculty of Computer Science and Information systems Universiti Teknologi Malaysia. Her research interest are in document management, information security and E-learning. She is eminent researcher and her more than 30 research articles are published in journals of international repute. She won international research awards and is selected in who's who for the year 2012.